The 2016 Greco Roman World Cup should have had more going for it. With the Rio Games just a few months away, the annual event had all of the cache to become something special. But perhaps it was the looming presence of the Olympics which worked against it, as participating nations held back many of their star wrestlers in effort to further prepare for the happenings in Brazil. That isn’t to say the meet was without serious talent – plenty of well-known Greco Roman athletes laced them up for the good of the cause. It is just that the timing of the event coupled with the last month’s worth of qualifying proved too big of a hurdle for the meet to gain the attention it normally enjoys. However, none of this mattered to Iran, which captured its fifth Greco Roman World Cup title in the last seven years. In the past regarded for its freestyle success, Iran has become one of the dominant Greco programs in the world and offered up a roster betraying its significant depth. Placed in Group B, Iran zipped through Ukraine 8-0 in round one. Mehrdad Mardani got things started at 59 kg with a strong 7-3 win over Levgen Miagkyi. With the score knotted up at 3 in the second period, Mardani locked and lifted for four. Miagkyi couldn’t seem to get the chances he wanted to after that, as Mardani coasted the rest of the way. Saeid Abdvali (IRI, 75 kg, world no. 10) got in on the action, as well. Facing off with an over-matched Levgen Pyshkov, Abdvali twirled through a nasty gut before closing things out with a takedown. It was over in the first period via a 9-0 tech. Other than a 1-1 criteria win for Ramin Taherisartang at 80 kg, each match against the Ukrainians was fairly lopsided. Things were just slightly different in round number two against Azerbaijan. Barely. Saman Abdouli (world no. 14), Iran’s chief understudy to six-time World Champion Hamid Soryan, began the duel with a 3-1 defeat of Sakit Guliyev. 2012 Olympic champion Omid Haji Noroozi (66 kg) positively blitzed Azid Aliyev. After receiving a chance on par terre offense, Noroozi immediately clamped around for a gutwrench, turning it over twice. Aliyev was given a warning to clear and as soon as he did, Noroozi lifted up and arched over the match’s concluding four points. At 85 kg, Islam Abbasov (world no. 20) represented the lone bright spot for the Azerbaijani squad, getting away with a tight 6-4 win versus Hossein Nouri. Turkey was next up for the Iranians in round three. Mehdi Zeidvand made an appearance at 66 kg and cruised past Abdulsamet Gunal 10-1 in a match where most of the time was spent with Turkey’s trainers wrapping up Gunal’s head than because of any actual wrestling. Saeid Abdvali had another go at 75 and yet again looked in prime condition. Abdvali accumulated a 7-0 lead over a game but outclassed Osman Kose in the first on the strength of a nifty slide-by and a couple of guts. He ended the assault 25 seconds into the final period with a step-out point. Heavyweight Bashir Babajanzadeh also acquitted himself quite well. An early takedown on Ali Arslan didn’t lead to any further scoring – the rest of the points accrued soon enough. A failed arm throw by Arslan at the boundary resulted in the Turkish wrestler losing his grip and rolling over his back. Babajanzadeh, thinking he had netted the match-ending four points, began celebrating. Turkey challenged the sequence but it didn’t matter. Babajanzadeh was awarded three points – two for a takedown and one due to Turkey losing the challenge, giving Iran an 8-0 win to move into the finals against Russia. 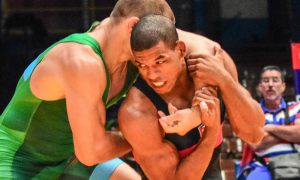 The final duel meet of the Greco Roman World Cup saw a marquee bout right away with Saman Abdouli locking up with 2016 U23 European champ Sergey Emelin. The action was tense throughout the contest. Both wrestlers clashed inside, each straining to hand-fight their way to an angle. Abdouli kept a brisker pace but Emelin stayed composed. Following a scoreless first, things got strange in the second. Emelin was knocked for a caution point. A short time later so was Abdouli. The battle turned ferocious with under two minutes remaining. Both wrestlers repeatedly fought for control. Abdouli rushing hard inside, Emelin doing his best to find a tie he could do something with. Just when things reached a feverish activity level, Emelin was dinged again, giving Abdouli another point and the decisive margin. Ramin Taherisartang had a nice showing versus Russia’s Ramazan Abacharaev, as the upstart earned a hard-fought 6-4 win. It was at 98 kg where there was a bit of a dust-up. Ghasem Rezaei (world no. 3) was given all he could handle courtesy of Cantemir Magomedov. Magomedov (not to be confused with Islam), stymied any and all attempts by the Iranian and looked poised to break through with points of his own. Rezaei, known for his patience, stayed true to his game and waited for a mistake. It wouldn’t come, so a par terre opportunity would have to do. Rezaei turned Magomedov for two but there would be nothing else the rest of the way. Nevertheless, that doesn’t take away what Iran accomplished. Even the country’s second-team athletes performed well and demonstrated how and why Iran has become a perennial threat on the Greco world stage. Another illuminating factor in this year’s Greco Roman World Cup was the emergence of younger talent from the other nations. Teams like Turkey, Azerbaijan and Ukraine showed that they too have wrestlers who could one day make names for themselves, as well. In an Olympic year when everything seems so locked in for what’s coming later in the summer, that isn’t a bad consolation prize to walk away with.